A few months ago, a friend and I had the opportunity to eat at a delicious restaurant in the city. I ordered the special Chilean Sea Bass dish and it was divine! I decided to come home and replicate the meal (with a few tweaks of my own) and I am just thrilled with the results. 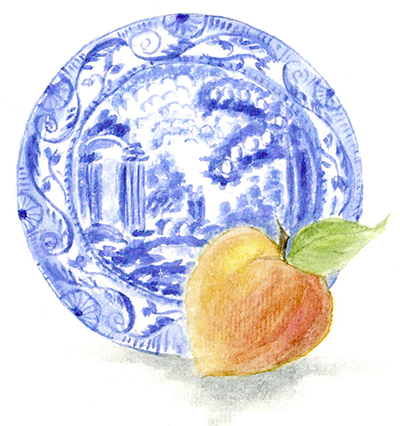 I liked how it turned out so well that I have made it for two large dinner parties and it has gotten many rave reviews. It is a rich and creamy dish that is sure to impress! The recipe does have quite a few components, but all of the components, except the fish itself, can be prepared days in advance and reheated for use when baking the fish. 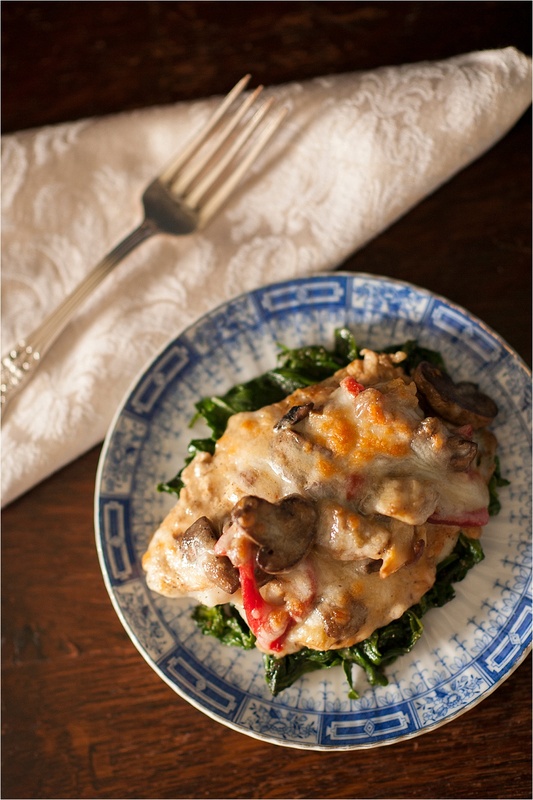 I really think that the make-ahead aspects of this recipe are a bonus when serving guests. Also, this recipe serves 12 people, so if your group or family is smaller then feel free to halve the recipe. We have 9 people in our family, so the recipe size is just perfect for us. Where I live, we don’t have access to fresh seafood, so I decided to substitute Tilapia for the Sea Bass. If you have fresh seafood near you, by all means, use your favorite fish. The flavors are so versatile in this recipe that chicken breasts would also work well if you would rather use that. If you use chicken, you will want to slice the breasts in half lengthwise to make them thinner and bake them for about 45 minutes until they are done. 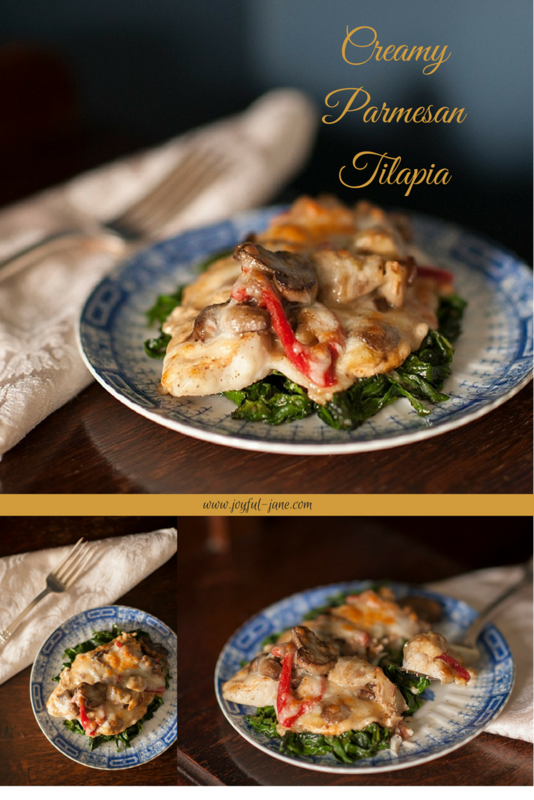 A few pictures of some of the delicious veggies that top the Tilapia. These pictures show the Tilapia with the Sour Cream Mixture before it goes into the oven and the baked tilapia with the toppings added just before it goes under the broiler to finish the dish. 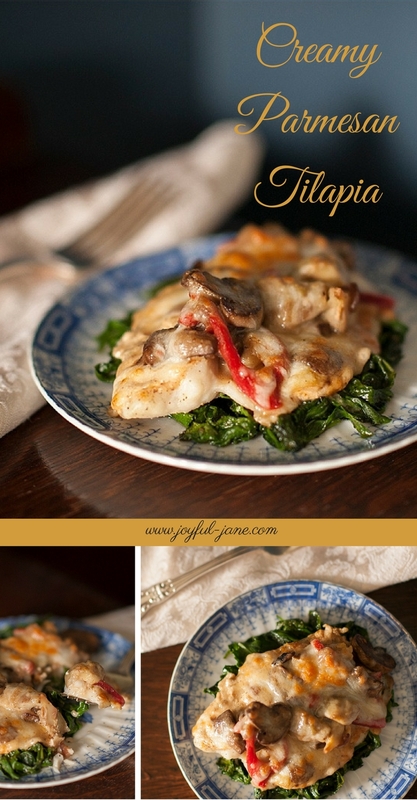 I like to serve the Tilapia over a bed of sautéed spinach. 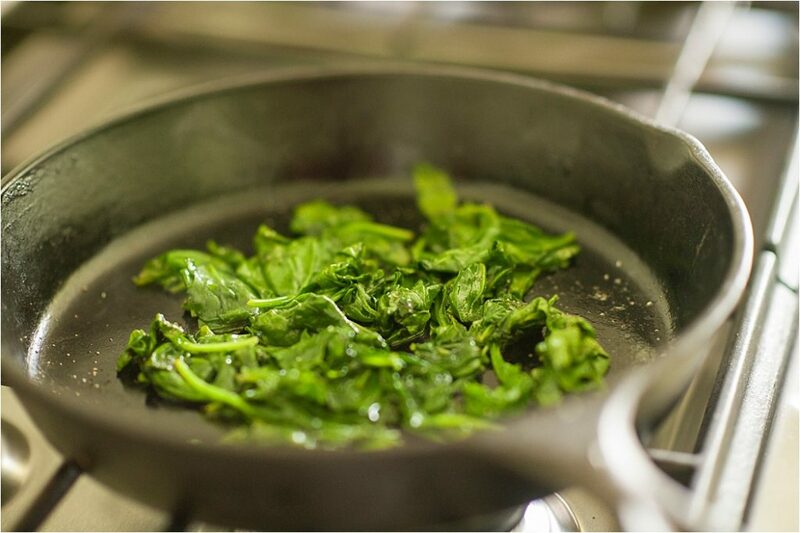 I simply melt a little bit of butter in a skillet then add the spinach and sauté to desired doneness. Then I season with salt and pepper. This is optional, as the Tilapia is great by itself or served with a side of green beans or a green salad. 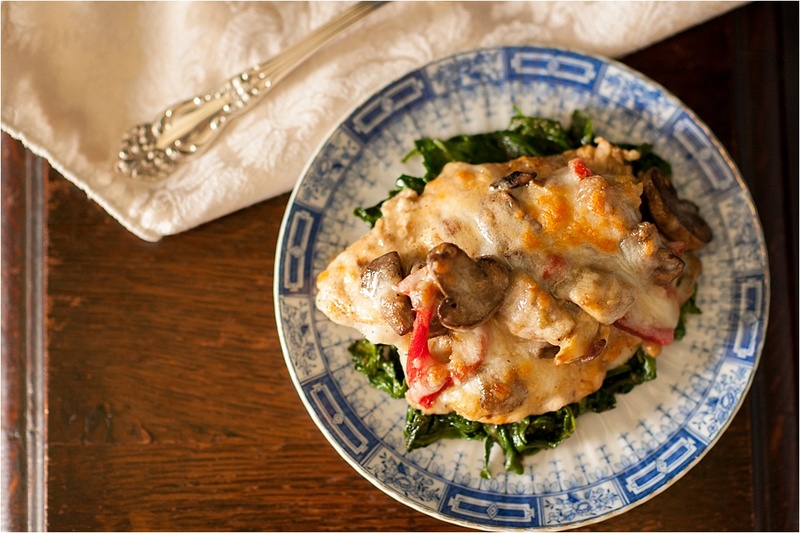 This dish makes a lovely impression as it is beautiful, healthy and tasty! Stir sour cream together with spices and cheese then set aside. Sauté onion in butter over medium high heat until onion begins to be translucent. Add mushrooms and sauté until mushrooms are nicely browned. Add garlic and sauté a few more minutes. Add 1/2 t. salt and 1/2 t. pepper. Stir in chopped roasted peppers or sliced pimientos and chopped artichoke hearts. Turn off heat and let sit for a few minutes to meld flavors. Set aside. Melt butter over medium low heat and add all ingredients except Glucommanan. After cheese melts, sprinkle in Glucommanan slowly and carefully so as to avoid clumps (this is a thickener that is THM approved, but if you don’t need the meal to be THM approved you may use cornstarch to thicken it, although I haven’t tried it with cornstarch, so I couldn’t say how much to use). Stir with a whisk until combined. Lightly sprinkle thawed Tilapia filets with salt and pepper on both sides then place in a greased glass baking dish. Spread the sour cream mixture thinly over the tilapia and bake at 375° for 20 minutes. Once fish is done, spoon veggies and desired amount of cream sauce on top of fish. Sprinkle shredded Monterey Jack cheese on top and broil just a few minutes until browned and bubbly. Serve Tilapia immediately. It is lovely served over sautéed and seasoned spinach or you may serve it with a side of green beans or a side salad, but those are optional. The photographs are so artfully taken! Love the blue dish the fish is on. 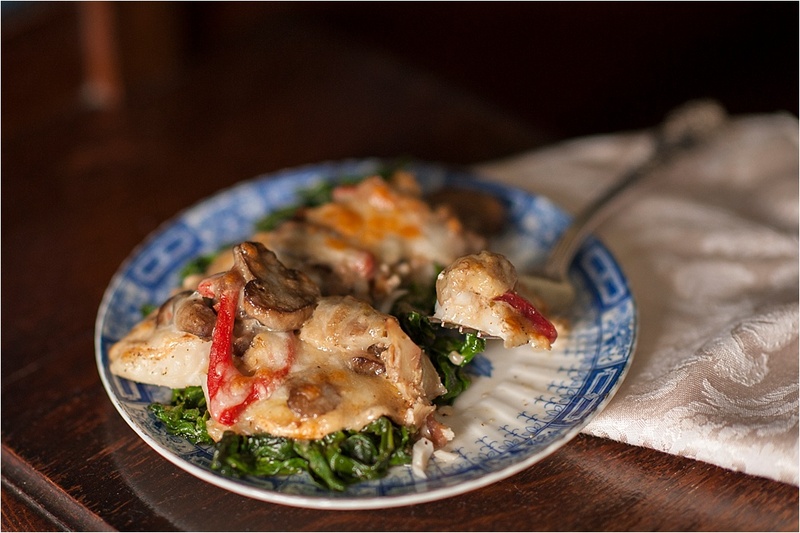 This recipe has my favorite flavors…artichoke hearts, spinach, Monterey Jack cheese to name a few. I am putting this on the menu for this week! I’m so excited to serve this to my family. Thank you! Can’t wait to put this in my rotation! Yum! This dish was so tasty! I can’t wait to make it! I am thrilled you posted the recipe.